Good afternoon. Thank you Speaker Rendon and President Pro Tem De Leon for inviting me to once again address a joint session of the Legislature on the State of the Judiciary. It’s an honor to be here with my fellow justices from the California Supreme Court, and my colleagues from the Courts of Appeal, the Superior Courts, and the Judicial Council. It’s a pleasure to be here with friends from the Bench Bar Coalition, the Open Courts Coalition, the State Bar, the Conference of California Bar Associations, and Judicial Council staff members—all who care very deeply about equal access to justice. And I’m especially grateful that my family could be here. Mark, Hana, Clare, as well as my in-laws—Dorothy and Jairo, and Vickie and Matt. But before I begin, I’d like to take this opportunity to congratulate Justice Kay Werdegar, on her retirement from the California Supreme Court and her 55 years of dedicated public service. Kay, we have flowers here for you. Let me say a few words about Justice Werdegar. She began her career in the 60s in Washington D.C. working for the United States Department of Justice in the Civil Rights Division. Her career culminated in 23 years on the California Supreme Court. Two months ago, the Governor stood where I am today and in his State of the State spoke very eloquently about how California must persevere in our values in times of upheaval. He spoke about three principles. He urged us to be guided by truth and by perseverance and by civility. And I agree with the Governor, and I would add one more principal that I urge that we be guided by. And that is the rule of law. Simply put, the rule of law means that we as a people are governed by laws and rules and not by a monarch. The Legislature proposes the law, the governor signs the proposal into law, and the Legislature and the Governor’s work is then interpreted by the judiciary for people in conflict. And very often we take the rule of law for granted—until it is challenged. And I submit to you today that the rule of law is being challenged. We live in a time of civil rights unrest, eroding public trust in our institutions, economic anxiety, and unprecedented polarization. The Southern Poverty Law Center says that California is home to 79 different ethnic “hate groups”—more than any other state. Our values, our rules, and our laws are being called into question and all three branches of government and the free press are in the crosshairs. We rely on the rule of law to protect us, we respect the rule of law to protect us, we are equal because of the rule of law. But what happens when the rule of law fails? Let’s ask my in-laws, Jairo and Dorothy. Two of 120,000 American residents who were interned by the U.S. Government for four years by an executive order. They were labeled “hucksters and peddlers” and they were forced into camps where keys were thrown away for four years. Jairo and his family went to Tule Lake, a camp for alleged rebels, where their every movement was watched by military towers and military tanks. Dorothy and her family were forced to Amache, Colorado, to live in shacks with snow they had never seen before. The rule of law failed again in 1882 when the United States passed an anti-immigration law, this time excluding Chinese, a law that wasn’t repealed until 1943. And again the rule of law failed when California and 31 other states passed laws forcing sterilization. And California led the pack with the dubious honor of having more sterilizations than any other state—20,000 from 1909 to 1970. What’s different now is that we have strength and experience. We have strength from the diversity of our residents. And thus, we have strength in the diversity of our leadership at all three branches of government and we have the collective diversity of our experiences. From farm workers to entrepreneurs, from 1 percenters to 99 percenters, all have of us have a voice in the way California goes and the development of our rule of law. So what happens when the rule of law stands strong? In California, you pass a law and the California Supreme Court interprets it so that Sergio Garcia, then an undocumented immigrant, can obtain a law license in California. The rule of law stood strong again in California in federal court, when Sylvia Mendez, now of course an American civil rights leader, integrated an all-white school in Orange County when she was nine years old, well before the U.S. landmark decision of Brown v. Board of Education. In California, the rule of law stood strong again when Andrea Perez, a Latina, and Sylvester Davis, an African American, were denied a marriage license. But they successfully challenged California’s anti-miscegenation laws. And the California Supreme Court overturned those laws 20 years before the rest of the country followed suit. The rule of law stands strong in California. We must remember our past both good and bad to fight the forces of fear and prejudice. Another way to fight the forces of fear and prejudice is to maintain strong public institutions. And because the judiciary is often the place where the rule of law is tested, where we talk about access to justice, where personal liberties are vindicated, I stand before you to talk about the judiciary and plead our case, which is really the people’s case. What is the judiciary? We are the trial courts, and the Courts of Appeal, and the Supreme Court. We are guided by a constitutional administrative body called the Judicial Council. I chair the Judicial Council, by virtue of the Constitution. Its primary goal is just like yours and that is to serve the people of California via the courts. And in the courts, we like you, seek to have fairness and access and a common sense approach. For instance, last year, I raised the issue of bail. And talked to you about the fact that we should not be penalizing the poor for being poor. We now have 11 different courts that are studying pretrial bail release programs. And I’ve named a taskforce to study and develop options in lieu of bail to ensure public safety and the appearance of the person back in court without requiring cash bail. Last year I spoke about fines and fees, still a state and national concern. And every branch of government is doing its part to address the issue. And I am proud to say that California is one of five judiciaries in the country that received a grant to develop an ability-to-pay calculator. And we are continuing to make strides thanks to you and Justice Cuéllar’s task force on language access. Thanks to funding, we now provide in 47 of our 58 courts civil justice interpreters, and domestic violence, family law, unlawful detainers and elder abuse. Further, just three days ago, the Judicial Council, through the members of Judge Dalila Lyons from Los Angeles and Judge Sam Feng from San Francisco, developed an immigration directory, a clearing house, electronically, a website, where people can go and get their questions answered. This is a website that is transferable and that we hope you will put as a link on your website or on library websites, or on county bar websites to give people the information they need. And you may ask, why are we even doing this as a state court? And that’s because we found many people who come into our courts asking about immigration, and so for us it is an access to justice issue. Also, thanks to you, we have the innovative grant fund, and based on the money you gave us, we were able to award 53 grants to 29 courts that are going to improve access in an innovative way in collaborative courts, in self-help kiosks, in family law, in domestic court, in veterans court. And we are also including online access in issues such as child custody, also mental health, also conservatorships. And very soon, I’m proud and excited to say, that I’ll be receiving the Futures report from my colleague Justice Carol Corrigan and Administrative Presiding Justice Bill McGuiness from the first DCA (District Court of Appeal) with a group of experts from our courts and with your public input talking about the future of the California judiciary and where we should go. I’ll be reading that report and studying it and then making it available. However, we cannot continue to do this and provide justice that Californians need and deserve without adequate and stable funding. Inadequate funding and chronic underfunding of the courts is just one way a justice system can become unjust. To be sure a justice system and our checks and balances can fail in the face of fear and prejudice. But they can also fail with lack of funding. So to keep our checks and balances intact, we need resources to provide justice to the people who need it. As you know in California, we have no limit on case filings. We cannot and will not shut out people who wish to file cases. You’ll never hear in the courts, “In our county ten thousand filings happened this month. Shut the doors because that’s our limit!” Justice has no quota. Since 2011, when I became Chief Justice, 6,408 laws have become law in California while the judicial branch budget has been shrinking. As I have said before, we are on the wrong side of justice when it comes to funding our courts. So you may ask how do we cope? With difficulty and with criticism. As you know the Constitution requires that criminal justice take precedent over civil justice. But do you know who's in the civil justice system? In the civil justice system are the people I talked about earlier—documented and undocumented, you and me looking for solutions to our critical need. Also, foster children who are trying to escape a damaged and abusive environment. Families who are looking for child custody and fair orders. Vulnerable populations like the homeless, the mentally ill, and the addicted. As well as employers and employees, tenants, landowners, those who’ve been injured, those who’ve been discriminated against. All are in the civil justice system. And we owe everyone in the civil justice system accessible and safe courthouses. We must make an investment in our infrastructure. But we should also safeguard our institutions by being vigilant. 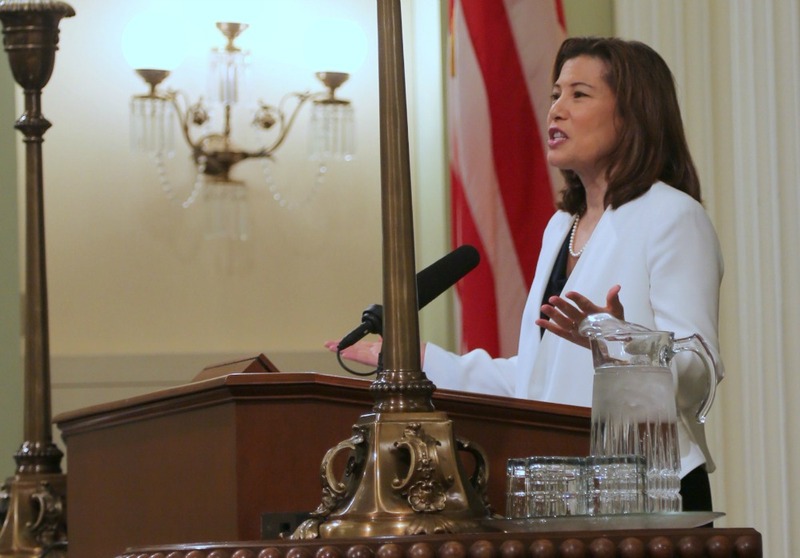 And vigilance to me means, as Chief Justice, as a resident of California, as the daughter of a farmworker growing up in an immigrant community and as a mother, that we take considerable care to protect and guard the promises we make in this great state about justice. It seems to me that what we need to do is actually consider our effect. Justice means more in this state, I believe, than any other considering our leading role in the judiciary and in decisions. And it is this concern for the rule of law and the checks and balances that prompted me to write a letter to the Attorney General and the Homeland Security Chief asking them to refrain from making immigration arrests in our California state courthouses. Each branch of government is co-equal and each of us should take care not to act in a way that undermines the public trust and confidence of another branch. We should step back and look back at why we have checks and balances and recognize what the justice system stands for and what it promises. We reach out and ask vulnerable populations to report, to bear witness to come to court, to protect their rights, to press their rights. You pass laws to protect people and so when we hear of immigration arrests and the fear of immigration arrest in our state courthouses, I am concerned that that kind of information trickles down into the community, the schools, the churches, the families and people will no longer come to court to protect themselves or cooperate or bear witness. I am afraid that that will be the end of justice and communities will be less safe and victimization will continue. These purposes of the executive branch are not in tension with the judicial branch. I’m not saying do not enforce immigration or federal law. I am saying, consider us on the “sensitive areas” list like a school, like a hospital, like a church. Where enforcement of immigration is the exception, not the norm. So many years ago, when Jairo came back from Tule Lake to rebuild his life in Sacramento with his mother, ironically his older brothers who were in Tule Lake with him were drafted into the war. But he came back to Sacramento to rebuild and they had nothing so they slept on the floors of a church for many months until they could rebuild their lives. And your Assembly chaplain, Rinban Bob and Reverend Patty Oshita come from the very church and led the very church of the floor on which my father-in-law slept for many months. The Japanese churches came forward to offer what they could in the way of hope and help and faith. My in-laws and many attorneys I’ve spoken to aren’t bitter. They relied on Gaman, which in Japanese means to endure the unendurable with patience and dignity. They relied on that because the rule of law failed them. We in this building who have sworn oaths have an ability and responsibility to deliver on the promise of democracy, the rule of law, and faith. We have sworn oaths. We know that our families came here to rebuild, to start over for that opportunity. So I urge you to keep all our democratic institutions strong, including the judiciary by adequate funding and resources to ensure the rule of law and the strong and vibrant beginning and process of our judiciary.